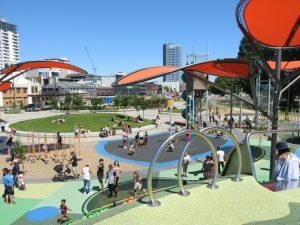 This is the largest playground in the Southern Hemisphere so there has to be something for everyone! There’s lots of different equipment for all age groups – sliding, swinging, balancing, climbing, jumping – your kids will only be limited by their imaginations. There’s a separate toddler area as well as a water play/paddling area (if your child likes water and you don’t want them getting wet, either take precautions like gumboots or a change of clothes or stay well away from that area!). Shade for some areas has been added and the trees will eventually grow, in the mean time take hats and sun block on sunny days and/or go early in the morning/late afternoon. Toilets (that talk to you! ), parking, coffee and some food available onsite with Mocoffee being recommended for a pie, cuppa and piece of cake. There’s also a Mexican food truck and ice cream truck (BUT expensive $5 for a kids’ scoop) that have also been recommended by our Facebook followers. The only downside of such a big playground is that it can be hard to keep track of your kids. If they’re older, you can probably just arrange a meeting point of where an adult will be. If they’re younger and need assistance or likely to run off, you might need to take an extra adult, avoid peak times (like sunny days, school holidays and weekends in general) or opt for a different playground. Address: Armagh Street between Manchester and Madras Streets. Parking available on Madras Street but it’s also approximately a 10-15min walk from the bus exchange and there are bike racks available to park your bike.